Food and wine are linked in Tuscany, indeed, in all of Italy. Such is the case at Tuscan Vines where one rarely finds itself to the familial table without the other close behind. With that spirit in mind, we travel to the commune of Gaiole in Chianti and review two wines from a prominent producer in the region. Gaiole is in North East Chianti Classico, about 8 kilometers from Radda and 20 kilometers north east of Siena. 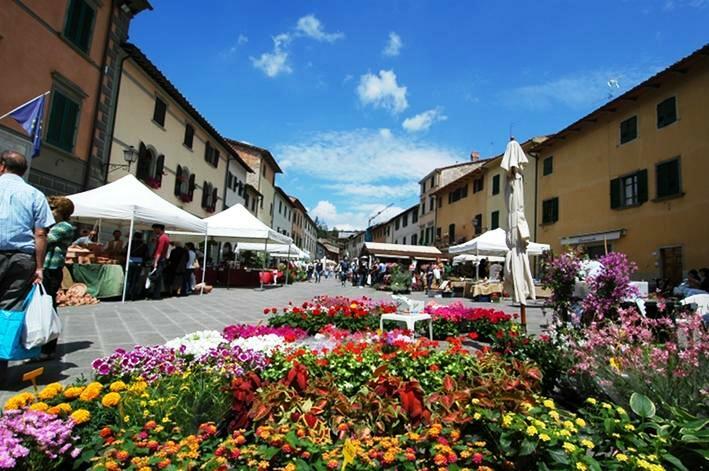 In addition to it’s prominence as a wine region, it plays host to an annual “Strada del Bianca” cycling road race that begins and ends in Gaiole. Capanelle is one of the areas most notable producers. A virtual baby on the Italian wine scene, the estate traces its wine producing roots to 1974 when Roman businessman Raffaelle Rosetti purchased the estate and the farmhouse. Today, the estate and its 16 hectares of vineyards produce about 80,000 bottles of wine annually, hosts visitors in its many borgi and also produces various agricultural delicacies. 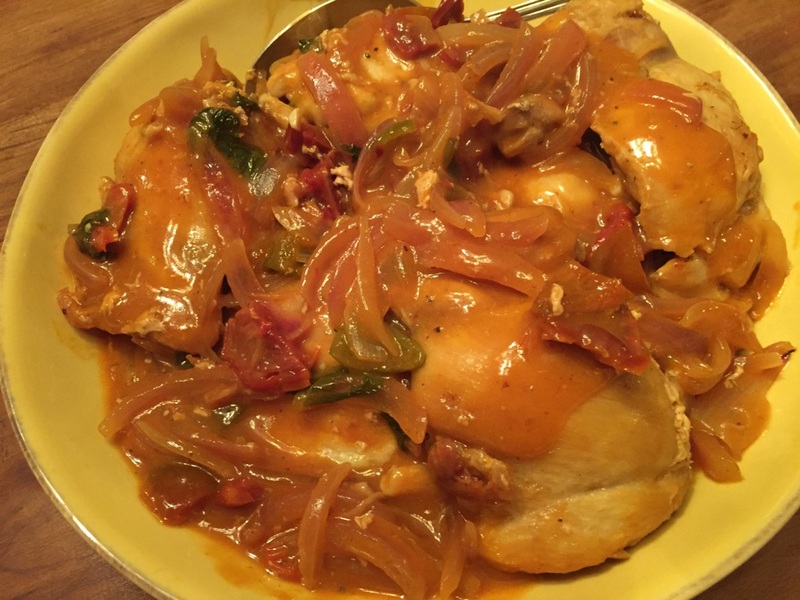 With a simple, one pot dish of Chicken braised in Tuscan wine, we opened two of Capanelle’s recent releases. 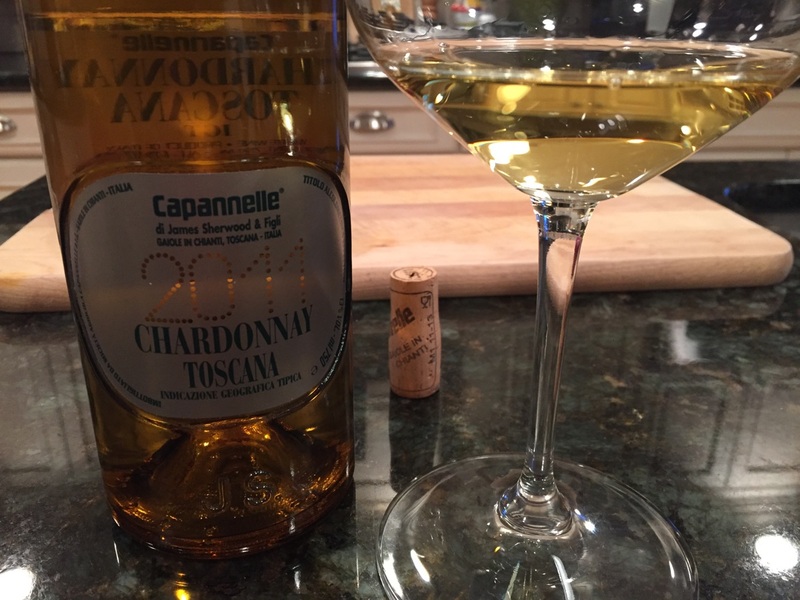 The 2011 Capannelle Chardonnay is one of the better Chardonnays that I’ve tasted from Tuscany. It’s a medium gold color and gives off lovely perfumed aromas of almonds, lemon oil, and french pastry. On the palate, the wine is surprisingly medium to full bodied. It’s viscous, with concentrated ripe flavors of tropical fruits, toasted bread and vanilla notes. Framed with refreshing acidity, it has a long, soft lingering finish. Vinified 80% in stainless steel and 20% in French barrique, the wine is well balanced and attractive. It paired very well with the slightly spicy chicken dish below. 90 points. About $40 retail. Disclosure: This bottle was an importer provided sample. 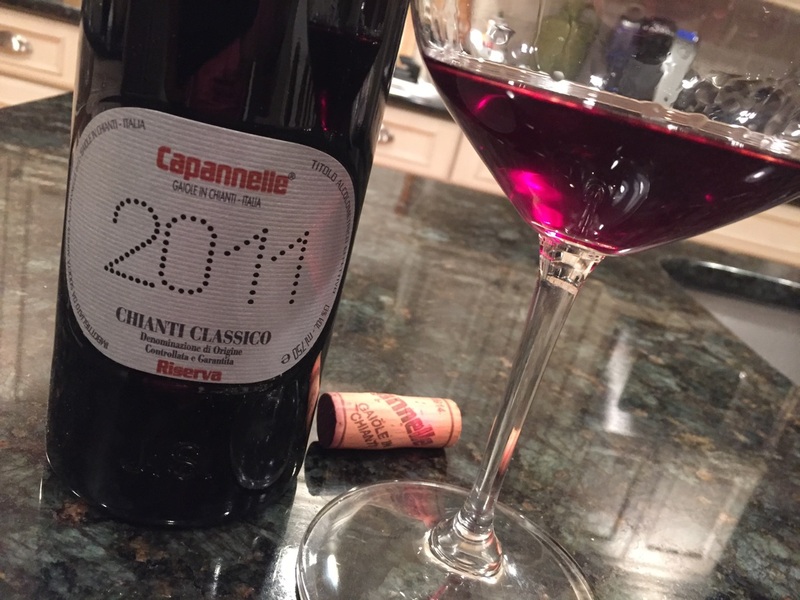 The 2011 Capannelle Chianti Classico Riserva is also a perfect foil for the above dish. Comprised of 100% Sangiovese and aged in Austrian oak, the vessel has imparted nothing to the wine. What you are left with is a stripped down, pristine expression of Sangiovese. Bright violet in the glass, the wine speaks terroir on the nose. Bright floral notes are accented with piney minerals, tobacco and berry notes. Fresh and brisk on the palate, the wine’s flavors mimic the nose with a soft mushroom and woodsy note that plays well against the savory herb notes on the mid palate. Aged 18 months in large 16 hecto-liter barrels. 91 points. About $30 retail. Disclosure: This bottle was an importer provided sample. Both wines paired very well with an easy one pot Tuscan chicken dish that I made. The recipe is below. The hardest part? Patience. 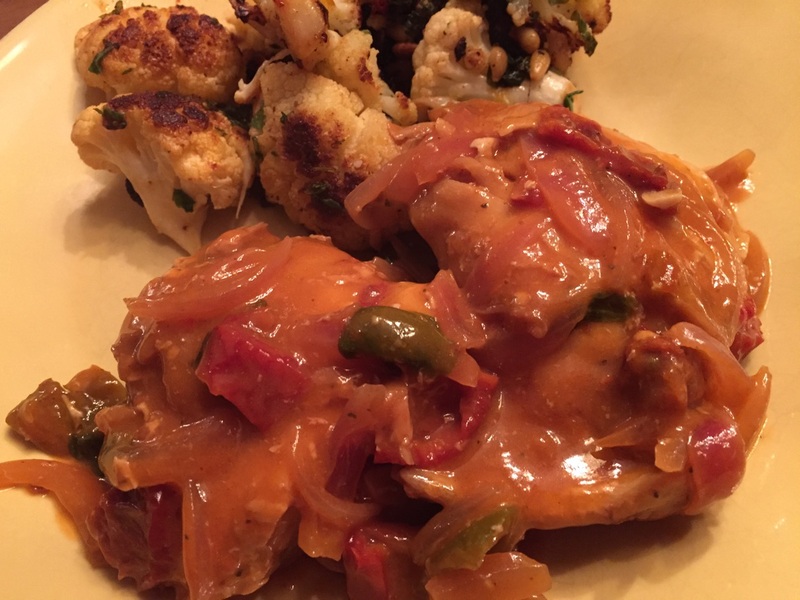 Brown the chicken well – it is the base for the flavor of the entire dish. In a heavy bottomed pan, drizzle some olive oil and over medium high heat, brown the chicken well – about 3-4 minutes on each side. Once finished, remove the chicken to a plate and then add the garlic and onions to the pot. The bottom of the pot will be getting very brown by this point. Once the onions soften, add the tomato paste and stir for 20-30 seconds to “toast” it and then add the wine to deglaze the pot. Scrape all the brown bits from the pan. This creates your sauce! Return the chicken to the pot. Add the sundried tomatoes and the cherry peppers. Cover and simmer 15 minutes on low heat to finish cooking the chicken. When done, transfer the chicken to a serving bowl (see picture above) and add the corn starch/water to the sauce in the pot. Bring to a boil and stir through. The sauce will thicken nicely. Pour all the sauce over the chicken and serve! Easy. Delicious. Tutti a tavola a mangiare!